The notes include lemon, bitter orange, bergamot, ginger, labdanum, rhubarb, sandalwood, coriander, cedar and white musk. 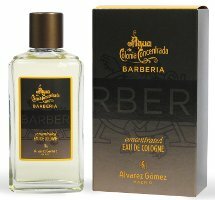 Alvarez Gomez Barberia is available in 150 ml Concentrated Eau de Cologne and in a variety of grooming products. The original Agua de Colonia is a terrific and under-appreciated fragrance, and so reasonably priced. I can’t imagine that this new product will supplant the original, but I’ll certainly be interested to try it. I would like to try it too…wish there was a retail store carrying this line near me.